The “Great­est Movie Musi­cal of All Time” is faith­ful­ly and lov­ing­ly adapt­ed by Broad­way leg­ends, Bet­ty Com­den and Adolph Green, from their orig­i­nal award-win­ning screen­play in Sin­gin’ in the Rain. Each unfor­get­table scene, song and dance is account­ed for, includ­ing the show-stop­ping title num­ber, com­plete with an onstage rain­storm! Hilar­i­ous sit­u­a­tions, snap­py dia­logue and a hit-parade score of Hol­ly­wood stan­dards make Sin­gin’ in the Rain the per­fect enter­tain­ment for any fan of the gold­en age of movie musi­cals. Sin­gin’ in the Rain has all the mak­ings of a Tin­sel­town tabloid head­line – the star­let, the lead­ing man and a love affair that could change lives and make or break careers! In silent movies, Don Lock­wood and Lina Lam­ont are a hot item but, behind the scenes, things aren’t always as they appear on the big screen! Mean­while, Lina’s squeaky voice might be the end of her career in “talk­ing pic­tures” with­out the help of a tal­ent­ed young actress to do the talk­ing and singing for her. 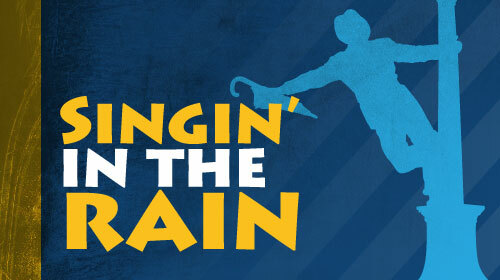 Sin­gin’ in the Rain is pre­sent­ed through spe­cial arrange­ment with Music The­atre Inter­na­tion­al (MTI). FREE park­ing is pro­vid­ed in the adja­cent Jen­nie T. Ander­son park­ing lot. April 12 @ 8 P.M.
April 13 @ 8 P.M.
April 14 @ 2 P.M.
April 18 @ 8 P.M.
April 20 @ 8 P.M.
April 21 @ 2 P.M.
April 25 @ 8 P.M.
April 26 @ 8 P.M.
April 27 @ 2 P.M.
April 27 @ 8 P.M.
April 28 @ 2 P.M.
ADA acces­si­ble seat­ing avail­able! To reserve ADA acces­si­ble seat­ing, please call the box office at 404−377−9948.